Dr. Michael Greger is a physician, author, and internationally recognized speaker on nutrition, food, safety, and public health issues. He’s lectured at the Conference on World Affairs, testified before Congress, appeared on the Dr. Oz show and the Colbert Report, and invited as expert witness in the defense of Oprah Winfrey in the infamous meat defamation trial. Currently Dr. Greger serves as the Director of Public Health and Animal Agriculture at the Humane Society of the United States, and hundreds of his nutrition videos are available at nutritionfacts.org with new videos and articles uploaded every day. STEVE PRUSSACK: Hello and welcome back to another session of Veganpalooza 2013. I’m your co-host Steve Prussack, and our next session is with Dr. Michael Greger. Hi, Dr. Greger. STEVE: Thank you so much for joining us. DR. GREGER: So glad to be here. STEVE: I don’t know how you do it. I visit your website all the time, and you’re always updating with the latest research. I don’t think there’s anything else out there like it. DR. GREGER: No, it really is the only kind of non-commercial, non-profit, science-based public service providing free daily updates on the latest in nutrition research with these short little video segments. Hundreds of videos now, more than a thousand topics, new videos and articles uploaded every day. I encourage people to check it out: nutritionfacts.org. STEVE: We’re excited to break down the most important studies that you’ve unveiled, that you’re bringing out during this session. First, before we get into all that and talk about reversing disease and plant-based diets, maybe you can talk about how you got into medicine. DR. GREGER: I think for most kids, in terms of wanting to go to med school, it’s seeing a grandparent get sick or die or something. But for me, it was watching my grandma get better. This was kind of back in the ‘70s. I was just a little kid, and my grandma had end stage heart disease. She had so many open heart surgeries, bypass graft operations, that she basically ran out of plumbing, and they sent her home to die. She was a cardiac cripple; she couldn’t walk, confined to a wheelchair. There’s nothing more medicine could do. Then she heard about the Pritikin Program. He was an early lifestyle medicine pioneer who put people on plant-based diets and exercise, had these kind of live-in centers, taught people how to cook. They wheeled her in, and she walked out. I’ll never forget that. For a kid, that’s all that matters, to get to play with grandma again. But she was given her medical death sentence at age 65, and thanks to a healthy diet, she was able to enjoy another 31 years on this Earth until she was 96 with her six grandkids, including me. She’s actually even mentioned in Pritikin’s biography. He was called “the man who healed America’s heart,” and he actually talks about Mrs. Greger who came in in a wheelchair, and within three weeks, she was walking ten miles a day. That just inspired me to want to help others in the same manner, and that’s why I do what I do. STEVE: When you saw the results with your grandmother, did you change your own diet? Did you take a look at your own lifestyle? DR. GREGER: It’s funny. I’m always kind of the skeptic. I think when we’re young, we just have this idea that healthy diet and lifestyle is something for older people. When you get sick, then you’ve got to kind of clean up your act. So actually it wasn’t for me until Dr. Dean Ornish’s landmark study was published in 1980 in The Lancet, probably the most prestigious medical journal in the world, which actually showed, proved kind of, there it was in black and white, of reversal of heart disease with drugs, without surgery, just with healthy lifestyle changes, which included the plant-based diet. Before, even though Pritikin cured, reversed heart disease in thousands of people, but he wasn’t taken seriously because we didn’t have angiography back then. We didn’t have these fancy x-rays for you to actually take pictures of people’s arteries. So people felt all of a sudden, said they got better, but you couldn’t actually kind of visualize the proof. But finally when we had these techniques to actually measure the width of the arteries, the lumen of the arteries, how open the arteries are, Ornish was able to show then that 80% of people that cleaned up their lifestyle, they were actually able to reverse heart disease, open up arteries, without drugs, without surgery. So reversing our number one killer in this country, heart disease, for both men and women. So the cure was discovered a long time ago but proven in 1980. So my god, even a skeptic like me couldn’t, the evidence was just overwhelming. So that’s when I cleaned up my diet. And still, decades later, hundreds of thousands of people continue to die of this reversible disease. It’s a tragedy, and I’m trying to do my little piece to put an end to it. STEVE: Are you surprised at this point that more people haven’t latched on? You’re talking about 1980 when these studies started coming. Really before that, but it really became more mainstream with some of his books. DR. GREGER: Yeah, you’d think. More recently in the last few years, CNN did that documentary “The Last Heart Attack,” which featured Esselstyn, and we have President Clinton, so we have these kind of high profile folks that are really bringing this to the forefront. But the problem is never the science. The science has been solved all along. It’s really that there’s just no kind of profit motive to get this information out there. So when we have a new drug, new surgery, new surgical technique, everyone will know about it because there’s going to be ads on TV for it. But you never see an ad on TV for broccoli, and there’s a reason: because broccoli doesn’t make anybody any money. So the same thing with this. Who would fund the studies, who would disseminate the results of the studies, who would profit other than, of course, the hundreds of thousands of people brutalized by this disease? But that’s not how our system works. It doesn’t reward results. It rewards, in terms of financially, procedures. It rewards the more you do, not the outcomes, not the results you actually get. If we actually paid doctors based on how their patients did, and paid hospitals and health care institutions, then we’d have kind of remarkable change in how things happen. But until that happens, unfortunately, reimbursement I think is really what’s holding us back. But the research is solid. That’s why I created the site, to just show that there’s just this mountain of good science out there showing that many of our top killer diseases can not only be prevented and stopped, arrested in their tracks, but actually reversed with healthy diet and lifestyle changes. Yet unfortunately, this is our leading cause of death. This is what’s laying to waste our loved ones, our communities, but it need not happen, and that’s the good news. That’s the empowering good news. STEVE: Maybe you could break it down for us. This is cutting edge information. You’re putting out videos every day. It’s incredible. Maybe you can discern some of the most important studies and do some myth-busting here. A lot of us are aware about how beneficial a plant-based diet is, but maybe you can talk more specifically and give us a good argument when people come against us for this diet. DR. GREGER: I think probably, just as kind of simple as possible, anyone comes up and says, “What about diet X?” which is the latest fad diet or whatever. It doesn’t matter what it is. In fact, many times, people ask questions like that and literally to me it is diet X. They’ll be like, “What about the Smith Diet?” And that’s just the latest bestseller that I haven’t read or even heard of. But you don’t have to know because all you have to say is, “Look, there’s only one diet ever proven to reverse our number one killer in the majority of people. Only one. And that is the strict plant-based diet. It’s the only one.” So look, if that’s all it did, all it did is it reversed, it cured the number one reason you and your loved ones are dying, if that’s all it did, then that should be the default diet until proven otherwise. But the fact that it also helps prevent, treat, and reverse diabetes and obesity and high blood pressure and all these other top leading killer diseases, the same diet, it’s just overwhelming. No other diet even comes close. STEVE: What about supplementation? Do you think if we’re following the strict plant-based diet, do we need to supplement? Do we need vitamin B-12 and things like that? DR. GREGER: Absolutely. Vitamin B-12 is critical. There are two vitamins that are not made by plants. Vitamin D is made by animals like ourselves when we go out in the sunlight, but a lot of people are stuck inside in cubicles all day, or they live at a latitude such that, at least during the winter months, they’re probably not getting enough vitamin D, the sun’s rays are at such an angle. So they need to get vitamin D somehow, so one can take monthly Caribbean vacations or take a vitamin D supplement. The other vitamin is vitamin B-12, not made by plants, not made by animals either, but made by little microbes that kind of blanket the earth. We may have gotten all the B-12 we needed from drinking out of well water or mountain streams in the distant past, but now we chlorinate our water supply to kill off any bacteria, so we don’t get a lot of B-12 in our water anymore. We don’t get a lot of cholera either, so that’s a good thing. But now because we live in a nice hygienic world, which is the way things should be, we don’t get a lot of B-12 unless we’re eating bacteria-laden foods, which is not necessarily a good idea. So everyone eating a plant-based diet – and not even a strict plant-based diet, vegetarians who continue to consume dairy and eggs – needs to ensure regular reliable source of vitamin B-12. In fact, really everybody should. The official recommendation by the Institute of Medicine, the body that sets the RDA, etc., most prestigious medical institution in the country, says that everybody over age 50 needs to take vitamin B-12 pills or fortified foods because they recognize that everybody, no matter what you eat, there’s just a highly likelihood you’re not getting enough as we age. So I would just recommend that people institute that recommendation earlier and that everybody should ensure a regular, reliable source of B-12 because you can’t take too much. There are no side effects. There’s no overdose. It’s just kind of expensive pee. And it can be a really problem, particularly for those who don’t get enough in their diet, and that is everybody eating a plant-based diet. So probably the easiest way to do it is one 2500 mcg dose once a week is all one needs. You can take 1000 twice a week, or you can take 100 or more a day, or maybe 250 or more mcg a day. You could also get it in fortified foods. There’s B-12 fortified nutritional yeast, and a lot of breakfast cereals and soy milks and things have B-12 added to them. But you just need to make sure that you get a regular, reliable source, and I do have a lot of videos on the website about making sure we get enough vitamin B-12. STEVE: There are lots of different ways to take it now. I’ve seen sprays, there are pills. What’s the best way, do you think, especially if you’re following a strict plant-based vegan diet? DR. GREGER: I would encourage people to get a chewable or sublingual B-12, basically any pill that’s just kind of B-12 rather than getting it in a multivitamin. Multivitamins have B-12, but unfortunately they often have minerals, like specific metals that can actually damage the B-12, so you may not be getting actually the full dose that’s in the multivitamin. So I encourage people to take a vitamin B-12 supplement separately. Something that’s either chewable or sublingual, just something that you make sure kind of disintegrates in your mouth or stomach because you don’t want to take a pill and then just have it come out the other end and not dissolve. But beyond that, basically I just encourage people to buy whatever’s cheapest. There are a number of varieties in the market; there’s methylcobalamin, cyanocobalamin, hydroxocobalamin. I encourage people to get cyanocobalamin, and the reason is not only is it the cheapest but we have the most data out there about reversing and preventing B-12 deficiency with cyanocobalamin in vegans specifically. So we know it works, we know what dose it works at, and if you want to take any of the other types, there’s a lot more uncertainty about the dosing regimen. So cyanocobalamin’s super cheap, so if you do the 2500 mcg once a week, it costs literally less than $5 a year. It’s cheap, simple, safe, and it’s critical that we remain paragons of health and we certainly can’t do that if we’re suffering from the very potentially serious consequences of vitamin B-12 deficiency. STEVE: Some of the other questions we might get are about protein, how do we get our protein, that kind of thing. How can we dispel the protein myth, and obviously it is possible to get enough protein? DR. GREGER: I like to say anyone who doesn’t think we can get enough protein from plants doesn’t know beans. Indeed, the legumes – the beans, split peas, chickpeas, lentils – are the superstars, the protein superstars of the plant kingdom. I encourage people to eat servings of beans or legumes every day, every meal. They’re just some of the healthiest foods there are. As long as we’re eating legumes, then it’s not a concern. The only people who need to be concerned about protein are people who are on weight loss diets. If they’re calorically restricting their diets, they really do have to make sure they get enough protein because they’re not eating enough food, period. Or maybe if you’re just eating iceberg lettuce on one extreme or empty calorie junk foods like French fries and vegan candy bars on the other side. But anyone who’s eating a variety of whole plant foods need not worry, particularly if you’re getting legumes in every day. And protein is just the tip of the iceberg of all the wonderful things that are in legumes. In fact, Brenda Davis’s and Vesanto Melina’s new Becoming Vegan is coming out at the end of this year, the beginning of next, in two companion volumes. I’ve seen an early draft, and they’re going to make a big push that vegans need to be eating more legumes. Of course, everybody needs to eat more legumes, but we can certainly take advantage of that great advice. STEVE: What about soy? There’s a lot of controversy around soy. What’s the latest research on soy? First of all, is it good for us or not? DR. GREGER: Soy as a legume is by definition good for us. But soy’s misunderstood. People don’t understand that there are two types. People hear the word “phytoestrogen” and they freak out a bit. People don’t understand there are two types of estrogen receptors in the body; there are alpha receptors and beta receptors. The phytoestrogens, the plant-based estrogen-like compounds, bind to the beta receptors, and our own estrogen binds to alpha receptors. So the effect of soy on different tissues depends on the ratio of alpha to beta. Estrogen has positive effects on some tissues and negative effects on others. For example, estrogen is good for the bones but bad for the breasts, increasing one’s risk of breast cancer. Ideally, we’d have some kind of selective estrogen receptor modulator to have estrogenic effects in some tissues but antiestrogenic effects in others, and that’s exactly what soy phytoestrogens do. Soy appears to lower breast cancer risk, which is an antiestrogenic effect, at the same time reducing menopausal hot flash symptoms, and that’s a proestrogenic effect. So with soy, you kind of get the best of both worlds. But one needn’t have to include soy in one’s diet, but it’s certainly a healthy component. Again, we should definitely eat legumes, soy or other beans, chickpeas, lentils every day. STEVE: Do you think, for example, tempeh vs. tofu, is it better to have it less processed? DR. GREGER: That is always a good guideline is to eat less processed. If you think about it, tofu is kind of like the white bread of the soy kingdom. You take a nice whole soybean, you remove half the fiber, half the minerals, you’re left with tofu. Now, soybeans are so incredibly healthy, you can take away half the nutrition and still be left with a really healthy food. Tofu is healthy. But think of tempeh. Tempeh you can actually see the individual soybeans in there. It’s a whole food. Miso’s a whole food. Edamame, the immature green soybeans, what a great snack. So that’s really the best. We should always try to choose whole foods rather than refined foods in general, and soy’s no exception. STEVE: What are your thoughts on processed food? There’s lots of vegan processed foods now. We can find replacements for every kind of meat. It’s unbelievable. What do you think? Is it dangerous to consume these foods, or is it okay? DR. GREGER: I think the existence of these foods is fantastic. That’s because it helps people transition away from the Standard American Diet. You approach somebody, and whether what motivates them is their own health or their family’s health or seeing their children graduate or get married or the great-grandkids, or whether they see a video like Peaceable Kingdom or they’re struck deeply with compassion for animals or the environment, regardless of kind of what pulls them in, if you say to them, “Okay, I have the answer to this deep desire of yours, and here is a kale salad,” and they’re moving from the Standard American Diet to the kale salad, it’s just insurmountable, I think, in many people’s eyes. Some people do it. But to go to a whole food plant-based diet from Standard American Diet is just unthinkable for many people. It’s very socially difficult, I think, for some people depending on their situation, particularly young people still living with their parents. So along comes these comfort foods, and so you can eat basically the exact same diet before but you’re chowing down on vegan chicken wings and ice cream and all these other things. You say, “Well, that’s not really healthy.” Look, it’s healthier, right? It’s certainly a step in the right direction. There’s zero cholesterol in any plant food. So no matter how many vegan donuts you stuff in your face, at least you’re not getting cholesterol compared to Krispy Kreme, for example. There’s less saturated fat, zero saturated animal fat, obviously. So we’re definitely, it’s definitely better. So even if you just care about your health, it’s better, even though these heavily processed foods can have lots of unhealthy components, such as trans fats from hydrogenated oils. It helps people make the transition towards a more humane, healthier diet. But what I would love to see as a physician is for people not to stop there. My grandma would have been dead if she just did vegan donuts. To get these kinds of therapeutic benefits, these healing benefits, one really needs to include as many whole plant foods in one’s diet. That’s why you hear me talk a lot about plant-based diets as opposed to vegan diets because “vegan diet” defines what you don’t eat, but that doesn’t say what you are actually eating. Whereas “plant-based diet,” okay, then you get the sense that you are centering your diet around whole plant foods. When you do that, that’s where you get all this additional benefit from. It’s not just what you cut out of your diet – and that’s important, cutting out the saturated fat, cholesterol, trans fats, animal products, absolutely – but you also want to take advantage of the healing power of plant foods, all these amazing phytonutrients. That is ideally found, most concentrated found in whole plant foods. So you get the best of both worlds by choosing a plant-based diet. I know there’s a lot of people that really take this to the extreme and condemn people or judge people for eating these less than healthy, processed, plant-derived “foods,” but think how these foods have helped people, have helped millions of people live healthier lives on this path. So I’m all in favor of the latest vegan junk food coming out because it’s just going to make it easier. When people say, “What? I can have marshmallows? I can have cake frosting? I can have the junkiest possible stuff?” then all of a sudden, some of those mental barriers are gone, and you’re like, “This is doable. Oh, I thought I’d never have pizza for the rest of my life.” Then once they’re there, okay, then they’re like, “Wow, what are you having on that pizza? Yeah, that cool new vegan pepperoni. But hey, have you ever tried arugula? It’s this really cool green, etc.” Then we start piling on the veggies. So fantastic for transition. I just would hate to see people make that a destination instead of a continued journey. STEVE: Another trending, we could call it trending, diet is the raw vegan diet where people are consuming everything uncooked. What are your thoughts on that, and are there studies to back that up? DR. GREGER: There is some very interesting data. Anyone who’s really interested in a deep dive, the best single resource on the subject is Becoming Raw by Brenda Davis. Fantastic book. She actually goes through all the science and reviews all the studies. Depending on your viewpoint, it could be very disappointing, what the science says, or very encouraging. 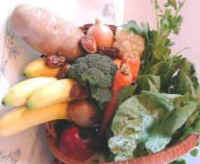 What raw fooders do right is that they include lots of these wonderful fruits and vegetables in their diet. They’re just eating these monster salads. Their salad bowl is like the big metal mixing bowl. Now that’s how we’ve got to eat salad. You get all of your five servings of fruits and vegetables a day, or nine servings is the official recommendation. You could eat five servings of spinach in one little salad, like easy. Five cups of spinach? That’s nothing. That’s how we have to think about dark green leafy vegetables, not some piddly little overcooked gray side serving, but like greens. So big, daily salads every day, that is what raw foodists could teach everybody. That’s fantastic. Unfortunately, much of the long-term data is not very encouraging in terms of how long-term raw foodists do, and they run into some things you’d expect, like vitamin B-12 deficiency if they’re not supplementing, things that you kind of expect. But they also run into things that you wouldn’t expect in terms of vitamin and mineral deficiencies, and they don’t appear to thrive, on average, over the long term. Now short term, they’re very therapeutic, particularly because they cut out the junk food. If all of a sudden you become raw vegan, by definition you can’t eat the vegan donut. So by definition, you’re eating a lot of whole, healthy plant foods. You can see really dramatic clinical results because you have these additional restrictions that cut out some of the junk. But what you don’t see, you don’t see advantages over a whole food vegan diet that includes both cooked and raw foods. So I would hate to exclude from one’s diet all these wonderful foods, and convenient foods, like canned beans. Oh my god, you can’t get cheaper, more convenient, more nutrition per penny; it lasts forever. So to have people not get canned beans because they’re raw vegan just makes me sad. Now look, they can sprout their legumes, eat sprouted lentils, fantastic, super healthy. I do it myself. But I don’t want people to have this impression that that is the goal or that’s something to strive for, what we should be striving for. The pinnacle, if we really wanted to be healthiest, would be whole food plant-based diet, but certainly lots of fresh produce, and that’s something they can certainly teach us. STEVE: Specifically, according to the studies, which diseases can be prevented, arrested, and reversed with diet? You’re talking about some of the most common and deadly diseases, but which ones can you put out there and say this is related to what we’re eating? DR. GREGER: If you go to nutritionfacts.org, it is just overwhelming, literally 1400 different subjects on nutrition. You could just spend days on there. Which is great because it has nice breadth, so if you have some weird disease or someone in your family does, odds are there’s videos about it. But it’s just so big, it’s a little overwhelming. So every year I do kind of a wrap-up video, like highlights from the year. Last year I did my “Uprooting the Leading Causes of Death” where I just go through the top 15 killers. CDC publishes every year the top 15 killers of the United States, and I just go through the role that diet may play in preventing, treating, and reversing our top 15 killers. So if you just go down the list, one, two, and three: heart disease, cancer, and COPD or emphysema, all three of which a healthy plant-based diet can play a role in preventing and even a role in treating disease. So heart disease, we heard from Ornish and Esselstyn. Number two, cancer, there are cancers, like Ornish then moved on to prostate cancer. He was able to actually reverse the progression of prostate cancer in men put on a vegan diet for a year. Killer number three, emphysema, we actually have data. Now, you say, “Emphysema? What could that possibly have to do with diet?” But actually the antioxidant, anti-inflammatory effects of whole plant foods may actually improve lung function in people with COPD. Number four, stroke, preventing strokes by eating potassium-rich foods, and potassium-rich foods are almost by definition plant foods. Killer number five is accidents, so I don’t know. Wear your seatbelt. Not much we can do about that. Wear your bike helmet. Number six, Alzheimer’s disease, we have good data suggesting that people eating plant-based diets have about two to three times less risk of becoming demented, and this is from the California Seventh Day Adventist study, and the longer one eats plant-based, the lower one’s risk falls for Alzheimer’s, the sixth leading killer. Seven is diabetes. Diabetes prevented, treatable, and cured, can be reversed, with plant-based diet, very exciting. Fuhrman has a new book called The End of Diabetes. Neal Barnard has a book, Brenda Davis has a book, all wonderful resources, and they all say the same thing: we can stop this disease, seventh leading killer. Number eight is kidney failure, which Harvard researchers found three risk factors for declining kidney function as we age. Number one, cholesterol. Number two, animal protein. Number three, animal fat. So not protein in general, not fat in general, but specifically animal protein, animal fat, cholesterol; those are the three risk factors for declining kidney organ function, all three of which only found in one place, and that of course is animal food. Nine is kind of respiratory tract infections, like inflammation, pneumonia, and eating just a few more servings of fruits and vegetables a day can actually dramatically boost one’s immune response to stimulation in terms of antibody response. Exercise actually also plays an important role. So for example, older women have about 50% chance during each fall season of getting upper respiratory tract infection, but that’s for kind of the sedentary population. If women are out walking, then it drops to about half that, and the runners in the group actually was less than 10%. So basically their immune system is working five times better in a sense just because they’re actually moving around as our biology intended. Number ten is suicide. You think, well, suicide, what can you do about that? But actually cross-sectionally, people eating plant-based diets have significantly improved moods, less anxiety, less depression. Finally we actually had a study, an intervention study where they took people, changed their diets, removed meat, removed eggs from the diet, and saw significant improvement in mood within just two weeks, so it can play a role in mental illness as well. Eleven is blood infections called septicemia, and certainly that can be food-borne illness like salmonella, campylobacter, the leading causes of which are animal products. Twelve is liver disease, which a plant-based diet can help prevent and can even be used to treat liver disease because it can help take pressure off the liver because of the protein load. Thirteen is high blood pressure. There’s another big superstar for plant-based diets. Completely preventable, it can be stopped, reversed, cured with a plant-based diet. Number fourteen, Parkinson’s disease. Now we’ve known that those that avoid dairy in particular have lower rates of Parkinson’s disease, but we have just featured, actually earlier this year, a video on treating Parkinson’s disease with a plant-based diet successfully as well. And number fifteen is aspiration pneumonia, basically kind of choking, which is due to stroke or Alzheimer’s or Parkinson’s, which we’ve already covered. So basically there’s the top 15 killers, and a plant-based diet can help prevent 14 out of 15 of them, can help treat the majority of them, and even help reverse about a third of them, including our top three killers. So this is exciting, good news in that we have so much power over our medical destiny. STEVE: Compelling. You would think at least half the population would jump on this. It’s astounding. Do you recommend detoxification and cleansing? If somebody is sick and you want to reverse the disease, do you recommend some of those methods? DR. GREGER: The most important thing is that your own body wants to be healthy. That’s the important thing, I think, to recognize. All we have to do is get out of its way. We don’t have to do anything special. It’ll heal itself if we just stop injuring it. For example, you walk and you whack your shin against a table or something, it would hurt and it would get all inflamed and swollen and red and painful. But then eventually it would get better unless you kept whacking your shin in the exact same place, day after day. What if you did it three times a day? It would never heal. It would always be inflamed and painful, whatever. You go to your doctor, and you say, “Oh my god, my leg hurts!” And the doctor says, “Okay, I’ll give you painkillers. We need to help with the symptoms,” instead of saying, “look, stop whacking yourself three times a day.” And we’re doing the same. We’re stabbing ourselves with a fork three times a day. Something that always stuck with me from medical training was the fact that within eight years of quitting smoking, your lifelong lung cancer risk approaches that of a lifelong non-smoker. Meaning that within eight years your body, your lungs, can clear out all that junk, get rid of all that tar and basically your lungs are like brand new as if you never picked up a cigarette. Now that’s not completely true. It never completely approaches that of a lifelong non-smoker, but if you didn’t get cancer yet, you can actually dramatically drop your chances. That’s just amazing that after decades of filing your lungs with smoke that the damage is reversible to a very large extent. It shows that if we just didn’t, and so every day, your lungs want to be healthy. Your lungs start the cleaning up process, but then you pick up another pack of cigarettes. You’re just pouring gas on the fire. The same thing. We wake up in the morning, our body’s like, “Okay, let’s heal today!” And then you eat breakfast, and then we start stiffening arteries and all those things that come along with our unhealthy diet. So to “detox” we just have to get back to eating healthy foods. We don’t have to do anything special. We just have to treat our body right and let our body take care of itself. STEVE: We’re winding down, but Dr. Greger, maybe you can talk about why you started nutritionfacts.org. What led to this incredible amount of research you’re doing every day? So I’m looking around, and this is actually at Countway at Harvard’s medical library when I was up in Boston, and being like, “Did you see this? Why didn’t we learn this?” So I started this little newsletter I sent out to people, and that turned into a DVD series. But look, I don’t want to reach thousands of people. I need to reach millions of people. Then Public Health Foundation stepped forward and said, “Let’s put all of your stuff online for free for everybody,” and I said, “Yes!” So that’s what we’ve been doing ever since. Now we’re up to about a million hits a month, very exciting. In fact my new annual presentation “More Than an Apple a Day” that just went up I guess last month is almost up to a million hits on YouTube. Very exciting. So yeah, it’s really feels good to be able to reach so many people. There are only so many days I can spend traveling on the road speaking to people, but now I feel that I can save lives in my jammies. STEVE: Awesome. And that website is nutritionfacts.org. Dr. Greger, we’ve touched on so many things here: B-12, protein, soy, processed foods, raw vegan diet, detoxification, cleansing. Is there anything in the research we haven’t touched on that you’ve been uncovering lately that you wanted to bring out today? DR. GREGER: Oh my god, there’s so much every day. People think I know more than I do, and I learn just as much as everybody else with every daily video. Putting together every daily video, I’m learning just as much as everybody else. I didn’t know this stuff either. So for me, it’s this constant discovery of, “Oh my god. I had no idea we could treat this illness or cure this illness or reverse this illness or even start the progression of this illness.” I’ve never even heard of some of these foods and mechanisms. So I encourage people, you can actually subscribe, you can put your email in, nutritionfacts.org, and you can get daily, weekly, or monthly emails which kind of summarize all of the latest science from both the blogs and the videos. In terms of what some of the most interesting new stuff is, Forks Over Knives just premiered, kind of gave a sneak preview of one of my upcoming videos, which I’m really excited about, called “Heart Disease Starts in Childhood.” Again, this is something we’ve known for a long time. It started when we were doing autopsy series on Korean War casualties, young guys, average age 21, coming back, and they were doing these autopsies on people who died of war wounds, and they already had cases of advanced atherosclerosis. You think, what? That’s something you expect to see in the elderly. So that started this whole series of research. I talk about the decades of research where they went earlier and earlier and then started looking at accident victims, earlier, younger and younger, and finding out that by age 11, nearly all kids have what were called fatty streaks in their arteries, which is the first stage of atherosclerosis. So atherosclerosis heart disease, the number one killer, starts in childhood. People have this sense that, “If I start getting a little chest pain or something, fine, then I’ll clean up my diet.” But the first symptom may be our last. It’s called sudden cardiac death. Half the people who die of heart disease, the first symptom is sudden death. So we can’t wait. You say, “Heart disease is reversible? Fine, I’ll wait until I have heart disease and then I’ll reverse it.” No, it doesn’t work that way in many cases. So based on this amazing childhood data, the decision is not whether or not to eat healthy to prevent heart disease. If anyone listening to this is over the age of 11, the choice is whether or not you want to reverse the heart disease that you already have. STEVE: Wow. That about wraps it up here. Dr. Michael Greger, the website again is nutritionfacts.org. Dr. Greger, thank you. We’re so grateful for this work you’re doing and contributing to the planet on such a scale. It’s just phenomenal. Thank you for being part of our event. DR. GREGER: I’m so glad I can help out in any way. STEVE: Again, the website is nutritionfacts.org. It’s Dr. Michael Greger right here on Veganpalooza.